Thinking it might help the holiday spirit of Christmas in Killarney and bring a bit of craic to Main Street, we decided to transport our talking cow to that fine town and put her in our outside seating area. I think she kind of looks fetching in her Santa hat. 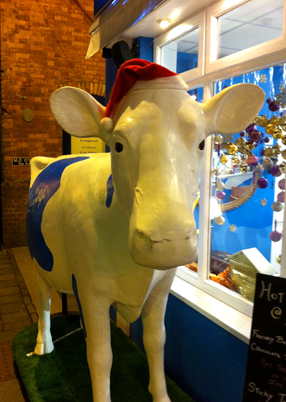 A proper Christmas cow! Anyway, within hours, the Killarney U.D.C told us we had to remove her or they would impound her. We begged them to reconsider, which they did. However, their answer hasn’t changed. We must remove our cow from outside our shop immediately. Killarney, apparently, is not the kind of town that would let a cow (even a fiberglass one) besmirch their hallowed paving stones. Buskers with rows of dancing leprechauns is fine, but we cannot put a cow in a seating area we have paid for. Go figure. Not that I really mind the dancing leprechauns. With the country falling to pieces around us, I think people need a bit of cheer and a bit of humour. I thought our cow brought both. Killarney U.D.C. does not agree. Killarney told us today they would impound our cow by 2:00 if we didn’t move it. After we rang, they said we had until the end of the day. What’s mad about this, is that there’s icy roads and moving it isn’t so easy. Is it possible they don’t have anything better to do, such as clear roads, than to arrest a Christmas cow??? Killarney Town Council has just said they might reconsider and let us keep her for the market. Fingers crossed!